What NOT To Do When Etching Glass! You are here: Home / DIY / Etching Glass: What NOT To Do When Etching Glass! 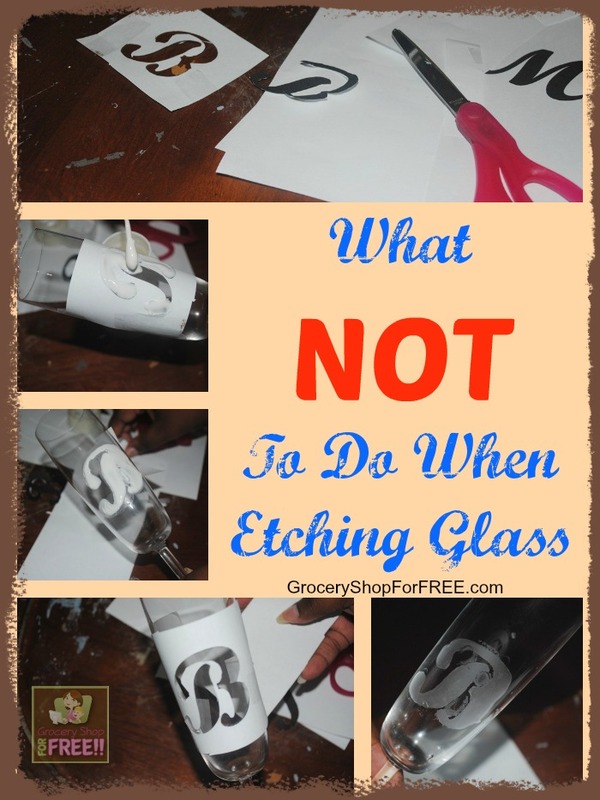 Etching Glass: What NOT To Do When Etching Glass! T is back with another great tip – Etching Glass: What NOT to Do When Etching Glass! I have never tried to Etch Glass, I would not even know where to start! That’s why I have T do these things to share with you, so you know how to do them correctly. Most of the time T is showing you the right way to do something, well, today we’ll learn backward! lol We’ll learn what NOT to do when Etching Glass, and that will teach us what TO DO to Etch Glass properly! We all know we can learn as much, if not more from a FAIL than from a success, so let’s get going! Would you like to see a trial and error tip? I definitely have one for you today. I thought I would try glass etching and I learned a few things. I want to share a bit of wisdom with you so you do not make the mistakes I made. Since this is more of a what not to do type post, you may want to bookmark this page for future reference. Initially I thought I could make my own stencil with letters I printed from my computer. I was pretty good at cutting out the letter I wanted to use. I taped the letters to the glass and even figured a way to get it to lay just right. Next I applied Armour Etching Cream. This was pretty easy but definitely my first MISTAKE! It looked good on the inside of the glass. I let this sit for exactly 20 minutes because I layered it on pretty thick. Putting on so much was not a good idea but luckily I had to learn the hard way. Another MISTAKE was taking off the stencil. I should have washed it off with the stencil on. I should have washed the glass straight on instead of leaning it over. I definitely helped the image smear. I ended with a somewhat blurry mess. I would have had a much smoother image if I had printed on adhesive paper and then cut the stencil out. This would have greatly helped the smudging and overall blurriness of the image. I decided to try again with tape. I went with a bigger tape that had a tighter seal. I had not learned my lesson in regards to too much etching cream. It did look much better on the inside. I let this one sit for 20 minutes again and this time I left the stencil in place. I did not learn not to avoid turning the glass sideways when I wash it. This created yet another MISTAKE. After removing the tape, the image was not great but it was a bit better. It looked much better than I expected but I am not happy with the collecting around the edges of the triangle. I blame my excessive use of etching cream. I also packed the sides and should not have. I have learned a lot from my mistakes and now it is your turn. Do not use a self made template that is not printed on adhesive paper. It is a HUGE waste of time. Try not to use so much etching cream. Less is more for sure. Make sure your image adheres without bubbles so that the etching cream does not leak underneath the stencil. Use an X-Acto knife if you have one. When washing, use water and a little dish detergent. I did this but my mistake was not washing it straight on. Do not tilt your object to one side. Doing so helps the cream collect in the corners. Wash your object with the stencil on. If you take the stencil off you could run the risk of smudging your masterpiece. I hope these WHAT NOT TO DO tips help you as much as they would have helped me. T is a work at home mom with a husband known only as The Honey and four children, lovingly referred to as, The Tax Deductions. I apply a lot of etching cream and then after a few minutes i take my brush and remove the excess, this way when I wash it there isn’t as much coming off. Mine usually turn out pretty good! Hope that helps! thanks for sharing this info! I have also found that it helps to scrape off the excess cream before rinsing. As far as I can tell, this excess cream can be returned to the bottle to be re-used, and it means less of the acid sloshes around on your project. Good luck with future projects! Great tip! Thanks for sharing with us! Another tip is not to wash the etching off in a porcelain sink as it could damage the sink. I have one and I am glad I learned this before trying my first glass etching. You should use a stainless steel sink….I’m going to wash in a container and dump outside on my road. I took a stained glass class in college (I was a studio arts major). I have some tips that might help. Trace your image onto white Contact paper (shelf paper). Before you cut out the image, apply the contact paper to your glass surface. After you smooth out the image (no bubbles) then cut out design with a craft knife (Xacto) (the vinyl of the contact paper will seal out water no matter how you hold the glass during rinsing, and applying before you cut will help those little details stick to your surface better). Apply the etching cram with a stiff haired paint brush (this will help with bubbles not forming in the cream) then every 5 minutes stir the cream with the same paint brush, this eliminates any bubble problems. When applying you can put on etching cream as thick as you please. Just before you rinse scrape off as much as you can with that same brush and put it back in the etching cream jar. That stuff is basically battery acid in a paste format, so you can refuse reuse reuse!! A $20 jar will last you forever! I had one for 2 years, and I do quite a bit of projects. After you scrape the excess back into the jar, rinse in whatever direction you like, just use the paint brush to help rinse and you rinse it out same time without needing gloves! After everything is thoroughly rinsed & you ran some extra water down your sink so you don’t have to buy new pipes in a few months, then you can peel off the contact paper and admire your awesomeness! I have some glass windows on the side of my front door that would look awesomely etched!!! Do you think I could get a good enough image to make it look good? I don’t want it to look bad but I have my heart set on etched glass. The rinsing is what makes me concerned. I have hardwood floors there so If I put plastic down to protect the floor and used a bucket and sponge do you think it could work? I appreciate any help anyone can give me. I have done a bit myself, and while it is more art than science, I have found pretty decent success in etching glass. I use a sand blaster for better results. I tried the etching cream, but even with perfect stenciling it left blotchy results. You can pick up a small air eraser (airbrush style blaster) for about $25 and media for about $8 at Harbor Freight. Amazon probably has some deals, too. I have a vinyl plotter now (Cameo Silhouette) but have tried contact paper and even printer paper with spray adhesive with good results if you take your time. Wow! thanks for the tips! I saw your article her and thought I would weigh in with the correct way to etch. The problem you are having with blurred edges is you are leaving the cream on too long. 5 Minutes is more than long enough. Also, after you cut out the design on the glass, cover the stencil with a piece of paper and rub over it to make sure all the edges are well bonded with the glass. PAT the cream on, do not brush it on like your painting. How it goes on is how it will look, Pat the cream on about a quarter of an inch thick. Once you have the stencil covered, then you can push the cream around gently to make sure there are no air bubbles and all the nooks and crannies have been filled. Make sure you cover the area surrounding the stencil well with overlapping layers of masking tape. When rinsing an open container, turn the glass completely upside down when you rinse, so no cream gets inside. Rinse under low pressure running water until all visible cream is gone, remove stencil and rinse again. Hope that clears up some of the details! Also after you mask it off and put your stencil take your blow dryer to it and heat it up 1. It helps get the bubbles out 2. Seals the edges 3. And I’ve noticed it’s helped the etching process look smoother 🙂 best of luck! So glad to find this before delving into glass etching! I took a thrift store trip to find some glass items, that way if it doesn’t turn out very well, I won’t be too bummed. I’m saving the good glass and the project I really want to do for after some practice trial/error pieces. It’s also helpful to see someone said the cream is basically like battery acid, this lets me know just how careful I need to be. Also I have parrots and any fumes can literally kill them, so I always work outside anyway, but it is good to know to keep it far out of reach. So glad it helped! Let us know how it goes! i hope it works out well for you! I make stencils using my Silhouette Cameo and adhesive vinyl. I learned that the etching cream is reusable (which saves lots of money because if you do much etching it can be expensive), so after applying the etching cream and waiting the required time for it to etch, I take a throw-away sponge brush and remove as much etching cream as possible, putting it back in the jar for further use. I then rinse the remaining etching cream off with warm water and dish soap.